As I sat down to write this reflection I had one of those moments, “wait . . . that was this morning?” I guess that’s to be anticipated for day like this one. My day began with a legislative committee hearing during which the news broke that SCOTUS made marriage equality the law of the land. You can read my thoughts on that here or check out this video that I was interviewed for below. After my morning committee meeting, there was worship, then a joint session of the HoD and HoB to discuss structure. Deputations were split up to be paired with the deputation of another diocese. My group from the RI deputation was paired with the Diocese of Southern Virginia. We were asked to brainstorm 5 things to keep that support mission and 5 things to change that support mission relating to General Convention, Executive Council, Provinces, and Dioceses. 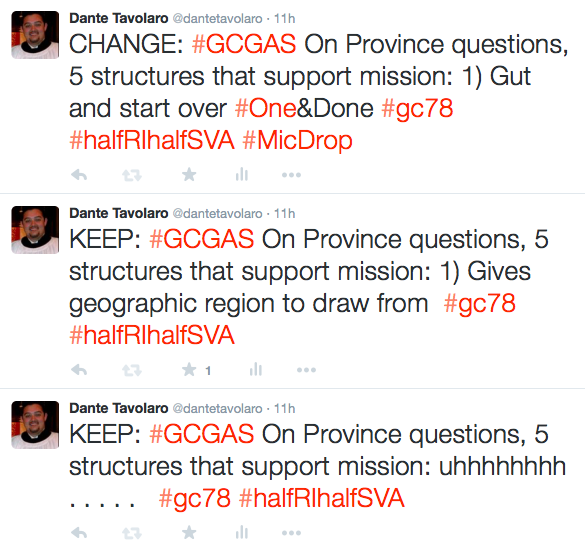 Groups were invited to email or tweet out their responses (tweets can be found with #gcgas – yes they called it #gcgas. Which is better than #gcsag, I think.) I thought it was a pretty great conversation and felt some energy. It may have also been that I was the recorder for our group and had some fun with the tweets. The reality is that, I do not anticipate anything coming from these conversations. Too much to talk about, with little time, and who knows what the follow up will be like. It was nice to have some conversation and feel some energy around the structures of the Church. Hopefully that is a good sign. After the joint session it was lunch, legislative committee, and a legislative session on the floor of HoD. There were moments of humor, and moments of frustration. Things were moving very slowly today, but hopefully that is just because we are settling into our rhythm, and getting used to new voting devices. What was most frustrating was the fact that the House of Bishops passed resolution A056: Authorize New Liturgical Resources: A Great Cloud of Witnesses; Weekday Eucharist Propers. Those of you who know me, know that I am not a fan of this project. More on that tomorrow. The day ended by going to an evening presentation followed by dinner with one of my fellow RI deputies. We had a fabulous conversation around substance abuse and the Church. In the midst of legislative marathons, and the joys and frustrations of the day I had two one on one meals with people I greatly admire and respect. Sometimes the best part of General Convention are the quiet conversations around a quick bite to eat. In my experience those moments are some of the most grace filled of all.